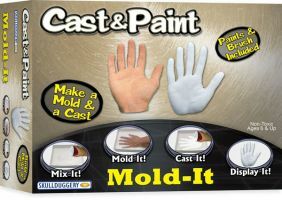 Cast & Paint brings you this series of molding kits that are all about hands. The Basic Kit is a great start to molding and casting; learn all about how molds are useful and the different kinds of molds and molding materials scientists use to duplicate things, then make your own mold of your favorite object - even your own hand! Comes with enough material to make several casts from the reusable mold. The Signature Pitch Kit lets parents and kids make a perfect mold of their Little League pitch grip, then cast it to preserve it forever - a baseball for display is even included. Consider getting a kit every year and tracking your kid's grip changes as he or she grows up. And the Gestures Kit is a really cool idea, letting kids cast their hand in any cool gesture they can think of. Go for a thumb's up, or try a retro peace sign - the choice is theirs. Choose one of three kits, or try them all! Cast kits are also a great way for kids to make their own awesome homemade presents!